As an excited Diego Maradona twirled his shirt from the stands and thousands of Argentina fans bayed before kickoff against Croatia, Lionel Messi was seen rubbing his forehead in stress.He managed just 20 touches in the first half, the fewest of any Argentina player, and trudged off uncomfortably. Yet worse was to follow in Thursday's second half of horror at Nizhny Novgorod as Croatia destroyed Messi's team with three goals for Argentina's worst group stage defeat in 60 years.About to turn 31 at the weekend, the Barcelona genius left the pitch looking lonely and broken after a game that may have ended his chances of ever winning a World Cup. Maradona, the 1986 World Cup winner whom Argentines constantly compare him to, went from waving a No. 10 Messi shirt to wiping tears out of his eyes, slumped in his seat.On social media, and among fans, the big debates over Messi - Is he as great as Maradona? Is he better than Portugal's Cristiano Ronaldo? - flared up fast and savagely. "I'm ashamed of this shirt. Right now, I want to burn it. Where was Messi? Where were Argentina?" said Renzo Alvarez, 47, shouting angrily among a group of angry fans, all wearing Messi shirts and some sporting masks of his face. "We have come all this way, spent thousands of dollars we can ill afford, cheered them to the rafters, and they show no heart, no balls, for the nation. I simply can't believe it. "Messi memes quickly sprung up on the internet. "Missing: Have you seen this man? Last seen, Nizhny Novgorod Stadium, Russia," read one mockup of a Wild West poster with Messi's bearded image. On Thursday night, he was upstaged by Luka Modric, Croatia's man-of-the-match playmaker and 32-year-old captain who played with joie de vivre and scored a stunning goal. By contrast, Messi barely figured, marked out of the game by an ultra-disciplined Croatia, unable to get a shot on goal, and only managing to thread telling passes on two or three occasions. 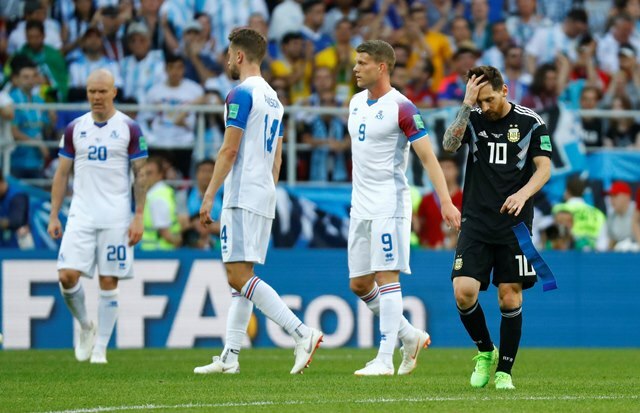 As against Iceland in Argentina's opening draw, when he missed a penalty, Messi trudged off silent and thunder-faced. "Leo is our heart and soul, but we couldn't find him with the ball," said manager Jorge Sampaoli, urging fans to turn their ire on him and not on Messi.